Sometimes you have to rip things to pieces and start over. When I first started quilting I was obsessed with the Missouri Star Quilt Company video tutorials. I loved watching them…I still do. The first tutorial I watch that had me thinking, “I wanna try that!” was the jelly roll race tutorial. Basically you sew a bunch of 2.5 inch strips together end to end, and then you sew the strips together over and over until you have a quilt top. As a new quilter, I thought all 2.5 inch strip rolls were the same. I went to JoAnn Fabric and bought their version of a roll of 2.5 inch strips. I was aware enough to notice there were only 20 strips in the package so I bought two. I did not know that a Jelly Roll is a trademarked product by Moda Fabric and contains 40-42 2.5 inch strips from a fabric line. Other design houses have variations of the same things: Roll Ups, Pixie Stripes, Rolie Polie, etc. I believed that two of the JoAnn’s versions would be the same as buying one of the others. I was wrong. The result was a disaster. All the fabric strips ended up grouped by value in the final quilt. All the lights, mediums and darks were together. It looked awful. Sometimes I would look at this picture and think, “Maybe it wasn’t THAT bad.” Then I would see it in person and think, “Nope is really is that bad.” Also, I look a this picture and notice how much my photography skills have improved. I was so discouraged. I loved the fabric, and I hated the result. I also hated that I hated the result. I wasted by little bit of quilting money on something I could not stand to look at. It was misery. So like any (un)healthy person, I put it away somewhere I would not have to look at it and pretended it wasn’t a thing. I denied that quilt top’s existence. I moved on to other projects, improving my skills along the way. About six months later, this quilt top started coming to mind a lot. I started to question if it really was as bad as I remember. I took it out and looked at it, concluding it was worse. The more I knew about quilting, the more I didn’t like it. However, I had come to appreciate the power of a good seam ripper. I ripped off the borders. And then I remembered ANOTHER Missouri Star Quilt tutorial featuring a technique by 3 Dogs quilting that used three 2.5 inch strips sewn together and then cut into 6.5 inch squares. So I ripped the quilt into sets of three strips, cutting those strips into 6.5 inch squares. I decided to keep them scrappy and random, so I threw the squares into a laundry basket. This quilt also started the habit of my youngest of wanting to play on any quilting related object I had laid out on the floor. No blocks in a layout, quilt top to be basted, or quilting in progress is safe. There was a time that a seam ripper represented failure to me. Only novice, unskilled, lousy quilters need a seam ripper. Excellent quilters don’t make mistakes. Now my the seam ripper represents freedom. It’s an opportunity for a do-over or a change of a plan. It gives me the opportunity to try something new or a different way of doing. And try again if that doesn’t work. What I love about this quilt is that the materials and essence of the quilt stayed the same. I didn’t buy new fabric or materials. The only thing that changed was how the fabric was arranged. I am an in-progress quilter. I am an in-progress person. I have not yet arrived a mastery level skill. I am on a learning journey. Part of learning is having the courage to declare that something isn’t working, rip it to pieces and reassemble it into something that does. The road to mastery is paved with the lint of ripped seams…so at least it’s a fluffy road. I heard the term bucket list quilts recently and I realized that I totally have a quilting bucket list. These are the big or the complex quilts that you take your time making and developing because they cannot help but be stunners! I broke my list into three groups: The quilts I’m dreaming/planning/thinking about doing, the bucket list quilts I started, and the quilts I’ve already finished. This quilt was designed by Willyne Hammerstien and is featured in her book Millefiori Quilts. Hammerstien’s Millefori quilts are sort of like the Godfather (mother?) of EPP quilts. The rosettes form a kaleidoscope effect when the fabric is repeated around the rosette. As you can see from this example below, the quilt is a show stopper. My husband bought me the book and the paper pieces kit for Mother’s Day/My Birthday. I’ve decided to wait to start it until my fabric fast is over. I want to go crazy with the fussy cutting and the colors, which means I need access to fabric. Plus I think after the fast is over, I’ll have enough fabric in my stash to get started that will help me get an idea of how many repeats of what I want are in a fat quarter so I can avoid over buying. I have a deal with my Instagram buddy, Annika, that if I haven’t made a rosette by January 1, 2018, she’ll pick the fabric for my first rosette. I think a barrier to finishing with be getting over the fear of starting in the first place. I anticipate this quilt being a slow stitcher. I would be amazed if I have the top assembles in less than five years. Quilt by paperpieces.com They have everything you need to EPP the quilt. Photo used with permission. The Dear Jane Quilt has a very special significance for me. My late mom-in-law was named Jane, and I miss her a lot. My daughter’s middle name is Jane in honor of the grandmother she was never able to meet. I am also a big fan of Jane Austen and the book Jane Eyre. When I heard there was a quilt called Dear Jane, I felt my heart pulling towards it. This is a quilt of many tiny pieces, which intimidates me. Recently, I learned that paperpieces.com had partnered with the author/publisher to offer an English Paper Pieced version. I’m waiting until after the fabric fast is over to start buying rows. I’m hoping this quilt will help me learn how to plan color placements ahead of time. This quilt will also be a slow one. I hope to listen to many Jane Austen audio books, watch many Jane Austen movies, and remember my mother-in-law while I create this quilt. I’m going really honest: If Angie Wilson of gnomeangel.com does a sew-a-long, I always want in. She picks the most epic quilts, breaks them down into steps and then builds a community to sew-a-long. It’s wonderful. Even though she’s partnered with paperpieces.com to do an EPP version of this, I think I’m going to try to foundation paper piece this one. I really want to hone by FPP skills. Also, that darn fabric fast gets in the way of EPP. I will say I enjoy the creativity needed to make this one work without more fabric. My daughter and I have a ritual. When her hair needs to be combed we watch episodes of the Midnight Quilt show and this episode is by far her favorite. She loves the colors associated with this quilt, and she thinks Ms. Angela is SO COOL! I would love to show her how to make a quilt using this quilt. Also, I have this creative curve ruler I really want to try. This quilt is in the book Quilting with Tula and Angela. I wanted to make it almost from the moment I saw it. After I saw Tula Pink’s line De La Luna, I REALLY wanted to make it. When the fabric arrived, I had to start cutting. I love the playful and mischievous of the fabric. This quilt is both. Plus, it turns out that the skulls are quite fast and easy to assemble. Elizabeth Hartman is a genius. Her ability to make animals into quilts with traditional piecing is incredible. I admired this quilt from the first time I saw the pattern. This pattern sat on my Amazon wish list for ages until my sister bought it for me for Christmas. I am really excited about finishing this quilt! I’d been itching to do an Elizabeth Hartman pattern ever since I saw Fancy Forrest and her butterfly pattern blew my mind. I bought the pattern from a deal of the day. I would regularly take it out and look at it, but I was intimidated by picking the fabrics. My sister rescued me. She was super helpful. I am so super proud of this finish! What’s on your list? What are the quilts or projects you’re dying to make? What is stopping you? Instagram sew-a-longs are my favorite and no one does a sew-a-long like Angie Wilson of Gnomeangel.com. Angie has a gift for identifying fantastic quilt patterns and engaging a community to sew a long. I have tackled quilts I would not dream of trying because I was sewing a long with her and the community she’s built on Instagram. During an Instagram live event she referred to a quilt as a “bucket list quilt.” That phrase captures why I love quilting along with her. Angie picks bucket list quilts and makes them manageable. In fact, I have my fabric sorted to join her for Tula Pink’s City Sampler Quilt in the 100Days100Blocks2018 sew-a-long. I am ready to get piecing for #100Days100Blocks2018 Check out all that Tula Pink!!! Recently she announced a new sew-a-long featuring the 1920s Farmer’s Wife Sampler Quilt and a partnership with Paper Pieces to provide an English Paper Piecing version of the quilt sampler. This kind of event is exactly the reason I started a fabric fast in the first place. I see a cool idea. I get all caught up in it. I forget to count the cost. If I wanted to buy all the paper pieces to English Paper Piece the quilt at one time, it would cost $195.00 OR I could spread it out over course of 9 months a pay $24.00 per month ($216) and then buy the finishing pieces ($14) for a total of $230. Next there are the acrylic templates. These are super helpful for fussy cutting the shapes AND the book only has paper templates…that means NO dimensions for cutting shapes. There are two template options: only the shapes that appear 10 or more times in the pattern ($80) or every single shape ($240). Total: $918.00 add in backing, batting, batting, and thread for quilting, you’re easily over a grand. Obviously there are ways to do this cheaper. Buy the book second hand, pay for the pieces all at once, only use the top ten templates, and use fabric from your stash and you’re down to $290. Or you could only buy the book and if you have quilting software like EQ8 (which I don’t) you can make foundation paper piecing versions. My point is that the expense of quilting can get out of control really quickly, especially when I don’t take time to reflect on what I actually need. I have a habit of getting swept up in the excitement of an idea without reflecting on the idea’s long term impact (you can read more about that here). I need to ask myself if the joy of hand sewing out weighs the stress of paying for materials to make the quilt. I want the answer to be yes so badly! I want to be able to join the Facebook group and post my blocks on Instagram. I want the challenge of stretching my EPP skills. If I really dig deep, I also want to play with the cool kids. I admire the other makers I see on Instagram, and I want to imagine that money doesn’t matter for them. I want to imagine they live in a world where they get to make whatever they want whenever they want. But I know that isn’t true. Angie has even said many times to stay within what you can afford. No quilt, not even a bucket list quilt, is worth the stress of carrying debt. Since I am on a fast and the only way I would be able to participate is if I was given the supplies as a gift, and I have yet to secure a wealthy quilting benefactor (is that a thing? ), my original plan was to say no. Jennifer of @yokokudo88 started the hashtag #GetYourQuiltyWishGrantedSummerEdition Here’s how it works: You post your wishes as a quilter and then someone else grants them. How magical is that?! So I posted my wish for the 1920’s Farmer’s Wife Sampler and someone offered it to me!!! I also posted three pre-cuts that came in my sew sampler box that I was NEVER going to us. I got to mail those to quilters who were excited about them. How wonderful is that?!? In a fun little twist, a quilter messaged me and said she thought she had an extra copy of the Farmer’s Wife and would look for it. She said it turns out is was The Dear Jane book. I asked if she was willing to part with her extra copy and she said yes!!! That’s two bucket list quilts without breaking my fast. Yay!!!! Now, there is no reason for me to spend $200-$400 on paper pieces and templates. That totally breaks the fast rules. Here’s my plan, I’m going to keep my fingers crossed and hope that the person who offered me her book is able to find it. I am going to do some research on making my own pieces or seeing if there are foundation paper piecing versions of the patterns. Then I’m going to play around with using my scraps from #100Days100Blocks2017 and all those little pieces of Alison Glass I have and the left over Tula Pink that will inevitably exist after #100Days100Blocks2018. Maybe that will work and maybe it will not. We will have to see. In the meantime, I am breaking my habit of leaping without looking and I am going slow and planning. My first block for #100Days100Blocks2018 was a legit stunner. I am still surprised that I did that. And many of you asked how. I am not an expert quilter, yet. My real area of expertise is in mental health. So I thought I would share my thought approach to quilting, specifically developing a growth mindset. Dr. Carol Dweck of mindsetworks.com coined the terms “growth mindset” and “fixed mindset.” She defines a growth mindset as, “The understanding that abilities and intelligence can be developed.” A fixed mindset views abilities and intelligence as permanent. A growth mindset looks at the various skills involved in quilting (selecting fabric, piecing, basting, quilting, hand sewing) and asks, “How I can get better?” A fixed mindset assumes how things are is how they will be. A growth mindset believes people developed skills by learning. A fixed mindset assumes a person came by their skills naturally, without much effort. One of the mistakes we make when comparing our work to another person’s work is assuming that person achieved that work with ease. My first block for 100Days had to be re-cut right away because I forgot to to allow for the double seam allowance needed for fussy cutting. Then I had to rip and re-sew many times to get the center to line up. When all was said and done, I probably invested two hours into making that block. I struggled to execute my vision. None of that struggle is obvious from the photo. In her book Grit, Angela Duckworth talking about improving a skill through deliberate practice. First, identify a stretch goal, something outside your current comfort zone. Work relentlessly towards that goal until you achieve it and get feedback on the process from others who are better than you. Increase the precision of my piecing. overall visual impact of the block, feedback it generates online, how many patterns, colors, fabric types did I use and did that work? Are my seams straight, is the finished block the correct size, do seams match where they are meant to? I hated how block nine came out so much that I re-did it with a solid pink in the middle. Block 43 I also hated, but I left it to remind myself I’m learning. You can see that even my block photography needed work. Here is the lesson I was learning about fabric selection last year: there is a difference between blender patterns and focal patterns. Your eye needs space to rest on a block and blenders give your eye rest. My fabric pull last year was almost exclusively focal fabrics and solids. None of the patterns worked well as blenders. This is the reason I had such a hard time mixing patterns…they didn’t mix! For this year, I’m using Tula Pink fabric, and I have blender fabrics. I’m noticing that I’m using those fabrics the most because they bring the block together. For example, I’m using the tortoise shell fabric Tula Pink’s Slow and Steady collection a lot. Notice how every fabric choice has a pattern but the block doesn’t look too busy. One of the things I enjoy about declaring this quilt about improving skills and learning is that it gives me freedom to play. Here’s an example of something I tried that did NOT work. There is something wrong with these colors, and I can’t explain what it is…I’m still learning about color…I can say that I look at this block and think, “Gross!” So it didn’t make it into the quilt. Oh well and on to try again. I also have a three rip rule. If I can’t get it right after three rips and resews, time to leave it as is or make a big change. Here’s an example of choosing done over perfect: In this block I chose matching fussy cutting/pattern over nesting seams. What is the skill you are trying to improve? Once you figure it out, decide how you’re going to measure it and follow makers who do a better job than you do. Ask people for feedback. Try, Fail, and Try Again. This is how experts are made. It’s hours alone in your sewing space. Over and over until you figure out what works for you. Then you get to show the masterpiece on Instagram, creating the illusion that you create with ease. I love forward motion. Want to watch me crawl out of my skin? Put me in a meeting where NOTHING is getting done, like a brainstorming session. I hate brainstorming sessions. I don’t want to put 100 ideas on a board and not examine them. Examining them in the fun part. I want to pick one that seems like it will work and start working on it right now. I can always adjust, right? There’s a word for that. The Gallop Strength’s Finder calls someone like me an activator. Activators love motion and doing stuff. There are activators in the world who are also strategic thinkers. I am not one of them. In fact, in my list of top five strengths (you can find yours if you take the Strength Finders Inventory) I have activator (likes forward motion) and adaptability (don’t mind changing plans on the fly). Put those two things together and you end up with someone who tends to jump into things and figure them out as she goes. For the most part, this works pretty well for me. Around November or December of 2016, I started to get the feeling that I might want to learn English Paper Piecing. Some people I was following on Instagram were doing it and I thought it looked interesting. I watched a YouTube tutorial, bought a starter kit online, and started cutting some fabric I’d gotten in my sew sampler box. I went with a Grandmother’s Flower Garden Pattern because that was what was on the YouTube video and in January of 2017 started cutting and sewing. I know it was January of 2017 because it’s now July of 2018 and I am about half done. I had no idea what I was starting when I bought a bunch of 1 inch hexagons and started sewing them together. You start with one hexagon. Each side of the hexagon is one inch. You sew on six more. Then you sew on 12 more. Then you add 18 white hexagons as a border. When you live in a house with preschoolers, toys always seem to find there way into pictures. Then you attach them with green hexagons which represent the garden path between the flowers. You need about 11 green hexagons to attach the flowers together. As you can see, they start off really cute. Then when I get to the white hexagon border I start to question my life choices. When I’ve assembled a few together and have a long stretch of green to sew, I am sure that I am crazy. All the white around the edges need a green hexagon. That’s about 100 green hexagons. I had no idea how big this was going to be. I thought I’d make it 8 rows of six flowers and that would be no big deal. Turns out, it’s a big deal. I learn a lot along the way when I leap before I look, and I also end up feeling frustrated. I’d never heard of fussy cutting when I started. I’m sad I didn’t fussy cut my flowers. I also have two flowers where the 12 hexagon row alternate fabric because I didn’t bother to check if I had enough fabric for a whole row before I started (turns out I did). See? The hexagons alternate. Those are the first two flowers I made. This is a bit of pattern for me. I read the quilting pattern once, quickly, get a general feel and then go for it. As a result I miss stuff. That is how I ended up with an extra seam in the backing of my Lepidoptera Quilt. And why Ice Cream Soda quilt is sitting in a box looking a mess. At this stage in the journey I’ve started to view my Grandmother’s Flower Garden Quilt as an exercise in persistence. I want to finish what I’ve started. I must accept that even thought I’d do it differently now, that does not make it any less of an achievement. There will probably be about 2,000 hexagons by the time this quilt is finished. Two thousand is a lot. I will finish what I have started. Half of the growth is achieved through persistence. I’ve learned my lesson: I need an understanding of what I’m getting myself into and make a plan to get myself out. If I understand the beginning and the end, I’ll have fun making it up in the middle. I few months ago I had this vision for a quilt project. Using only left over fabric from another quilt project I would make a blue/purple peacock on a background that went from yellow to orange to red. I was super excited when I started working on the project. Check out that eye!!! I was so excited I did not read the pattern closely and ended up piecing the project backwards. I thought that was pretty cool because I think I have enough fabric to make another one in reverse, so green to blue to purple background with a yellow/orange peacock. If I made the second one the correct way it would look like they were mirror images. Then I started scrolling through other people’s interpretation of the pattern on Instagram, realizing that what I was treating as background was actually the peacock’s feathers. Now my idea feels stupid to me. How did I not catch that the feathers make up the background?! I’ve spent more than 30 hours hand piecing this project, and I don’t want to look at it. I don’t want to do another version mirrored version of my same stupid idea. Some of you may be tempted to write a comment about how much you like what I made and reassure me that my idea is not stupid. I am gong to invite you not to do that. If I don’t believe that for myself either I won’t believe it from you, or I will need you to remind me forever. This is why telling someone who is anxious that everything is okay is a waste of your time. If a person cannot do it for themselves, then it won’t stick when you do it. You’ll have to keep doing it. Forever. It is also not effective to tell people who are anxious to calm down or stop worrying. That’s roughly the same as me telling you not to think about Abraham Lincoln. Seriously, stop thinking about Abraham Lincoln. Stop thinking about the beard and the top hats or the Emancipation Proclamation. STOP THINKING ABOUT ABRAHAM LINCOLN ALREADY!!!! To which any sane person would say, “Every time I try to stop thinking about him you remind me of him, and I start all over again.” That process is exactly what happens to an anxious person. Each time you tell them to calm down they are reminded of their anxiety and start all over again. So what to do instead? Ask people what they need to handle whatever it is they are worried about. If they don’t know, I either invite them to take a few deep breaths or take a few moments to think about it. I do not solve the problem for them. Solving the problems leaves ME with the burden of relieving THEIR anxiety. No thank you. Where does this leave me and the peacock? First I need to make peace with how my original vision is different. Then I need to decide if I want to spend another 30+ hours making another version or if I want to move on. One of my favorite things about quilting without deadlines is that I can put something away for awhile and look at it again when some of the original emotion has worn off. So away goes the peacock for a bit. 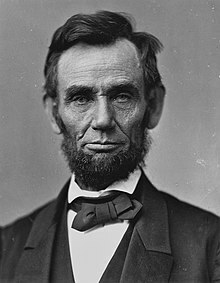 Until then, I’ll be thinking about Abraham Lincoln. The countdown is on! We are on our way to the start of another 100Days100Blocks challenge. I love this project! I have so much fun sewing along with all the other quilters. Since this quilt-a-long is such a marathon, I thought I’d share my process with you. First, I sew ahead. I would not be able to manage this pace otherwise. I start by putting all the fabrics I’m using in one spot so I can pull fabric for multiple blocks at the same time. I usually pick a focal fabric (in this case Prince Charming), and then look for accent colors in the print. I set the blocks together how I envision it working and then take a picture so I don’t forget what I had in mind when I actually go to cut fabric. Next I put the fabric in bags with one of my alphabities blocks, so I don’t forget which block I was pulling fabric for (notice a theme of me forgetting things sometimes?). After I cut the fabric I lay it all out on a piece of batting so I can see it all together. I also work at least two blocks at a time. Having two blocks going means I can chain piece. Here’s how I have my sewing area set up: I bought a press and flip cutting mat. It has a cutting mat on one side and a pressing mat on the other. I also have a tiny iron. I set up the pressing mat and iron on the side of my sewing table. I place the batting on the floor to my left. I press and then realign the blocks. Using the batting and pressing right next to my sewing machine minimizes that chance that I mix up pieces. I did that a ton last year and ripping seams is a pain! I also keep the alphabities piece over the block so as to not mix things up. The process then become a lot of sew, press, repeat until…Ta Da! A finished block. Hope that was helpful. Happy stitching!